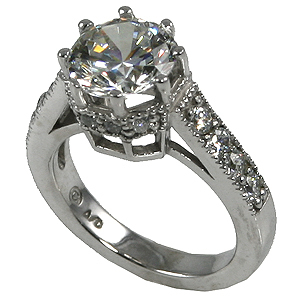 Stock #S501SS:Sterling Silver available with 1, 2 and 3 Carat center w/8-.15 ct accent stones down sides and 8 .02 carat accent stones around the head... Gorgeous Top quality Russian CZs. Immaculate Top-quality workmanship, Heavy shank!!! Matching band available for the 1 carat version.